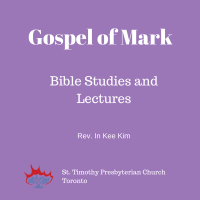 This is the last session for this season in the study of Mark. Rev. Kim realized that 5 weeks is too short of a time to cover the whole book in detail and do justice to it. Therefore we concluded the study up to Chapter 10. Interesting to note is that Chapters 1-10 cover the first 3 years of Jesus’ ministry, while the last half of the book covers only 1 week of his life. We look forward to studying that one week! *NOTE: the first 10 minutes or so of this session was not caught in the recording, so the recording begins part-way through it. We apologize for that inconvenience. There was a lot of engaging discussion and dialogue in this session. Please listen to capture the vitality of this study of the Word of God! We will resume the study of Mark in the fall of 2015. Enjoy your summer!